'Witch' Burnings Haunt Kenyan Tribe Eleven people suspected of witchcraft were killed in May, but questions linger over whether neighbors believed the victims were witches. 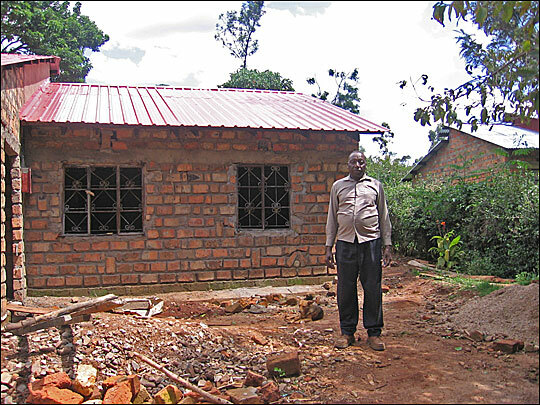 The belief in witchcraft thrives in the Kisii tribe, and reprisals are becoming increasingly violent. 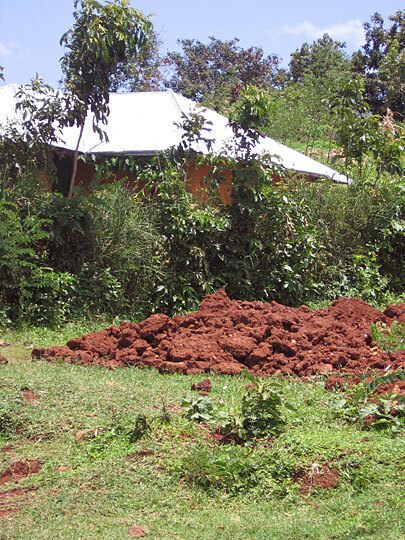 This mound of earth is the only evidence left of a house that was destroyed during the May 21 killings in Kisii. The owner has reportedly fled the community. 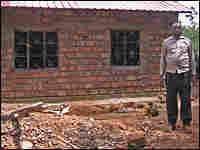 Enoch Obiero stands in front of the house he is rebuilding. In May, a mob burned the previous house to ashes. His wife, who was killed in the attack, is buried nearby. Onyango Nyakundi is a shoemaker and a witch doctor in southwestern Kenya. He says his concoctions of herbs and other treatments heal a wide variety of ailments. "Believers heal faster than nonbelievers," Nyakundi says. In much of Africa, people believe in some form of witchcraft. Just recently, soccer fans in the Democratic Republic of Congo accused a player of using black magic at a game. The ensuing riot killed more than a dozen people. In Tanzania and Ghana, belief in the magical powers of albinos and hunchbacks has reportedly led to a rash of killings this year. In May, 11 people died in a "witch" burning in southwestern Kenya, but questions linger over whether neighbors in that particular region of Kenya believed the people killed were witches. The burning took place in a farming area in the lush southwestern reaches of the country, dominated by the Kisii tribe. News of the incident made headlines in Kenya, but there was little surprise among the general public. That's because Kisiis are known to believe more fervently in the power of witchcraft than any other tribe in the land. And among the Kisiis, reprisals against witchcraft reportedly are getting more and more violent. Local authorities say that in May, a security guard turned over a suspicious notebook he found at a school. The notebook reportedly listed the names of local witches and the minutes of their meetings. But before turning over the book to the authorities, residents of the area apparently copied down the names. Over a two-day period, a mob cut down 11 mostly retired and elderly people and burned their homes to cinders. 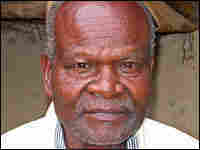 Enoch Obiero, a Pentecostal minister, says the mob came to his door and dismembered his wife, a retired schoolteacher. He claims that jealous relatives paid the killers. "They didn't even come to the funeral," Obiero said. "It is not easy to forgive someone who has done you such a terrible thing." The authorities say they have arrested more than 100 people in the burnings, but whether they will successfully prosecute any of the suspects is unclear. It is rare for people in this insular farming community to testify against one another, for fear of revenge attacks. 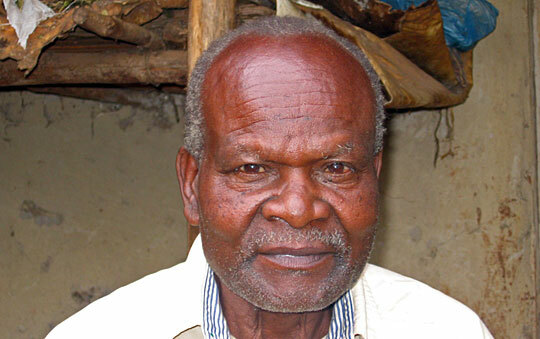 Instead, many protect themselves by visiting witch doctors like Onyango Nyakundi. "The person who does not believe in that is just living a life in denial," Nyakundi said. He added that people cry "witch" for any number of reasons. Sometimes, they really believe that a witch is in their midst. But sometimes, he says, accusations are made to settle petty scores. To understand what happened in May, it is vital to understand a core value in the Kisii region and among many believers in black magic: They say there is no such thing as a good witch.